Families who want to enjoy a unique camping experience are sure to love the medieval village of La Paille Basse, which is surrounded by intense natural beauty. Staying in style is easy when you book this luxury camping site through LuxCamp. The natural beauty of the area can be explored in a number of exciting ways, such as taking a specially organised cycling or hiking tour. The kids are also sure to love pony trekking through the area, while those who have a strong sense of adventure can try kayaking and canoeing. 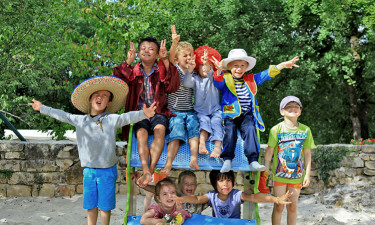 Why choose Camping La Paille Basse? Special creativity workshops are organised every week for children who want to learn a new skill during their camping holiday. In addition to splashing around in the large onsite swimming pool and making use of the adventure playground, the little ones are also treated to a special show each day. No luxury camping experience would be complete without enjoying a delicious and freshly prepared meal in the onsite restaurant. The site also boasts a fully stocked bar, while a disco is held during the summer months where guests can get their groove on.